Google is giving away 10GB of extra storage space in Google Drive with its newly introduced Office suite for creating, editing and collaborating Microsoft office documents, Quickoffice. The promotion period for up to two years, till October 2015. In order to avail this promotion offer, you need to install Quickoffice app on your android phone or iOS smart devices (iPhone or iPad). 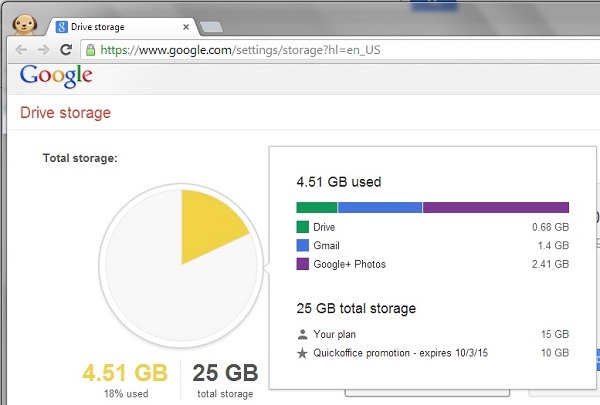 After installation you may verify the available storage space with Google storage settings page. What will happen to your storage after the completion of two years of promotion period?, as per the Google support forum the 10GB space will disappear from your available storage capacity. But, I think within two years most of the cloud storage service providers will increase the free storage limit. Its already hinting from the move made by Yahoo by fixing its email storage to 1TB.